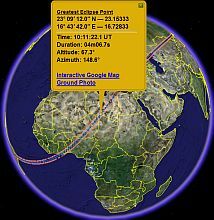 Recently someone contacted me with some interesting Google Earth files which show solar eclipse paths (where the eclipse is viewable on the ground), both total and annular (for information on solar eclipses see this Wikipedia article). His web site contains a few historical ones dating back to 1961, but is mostly focused on near-term (those in this century) future eclipses. 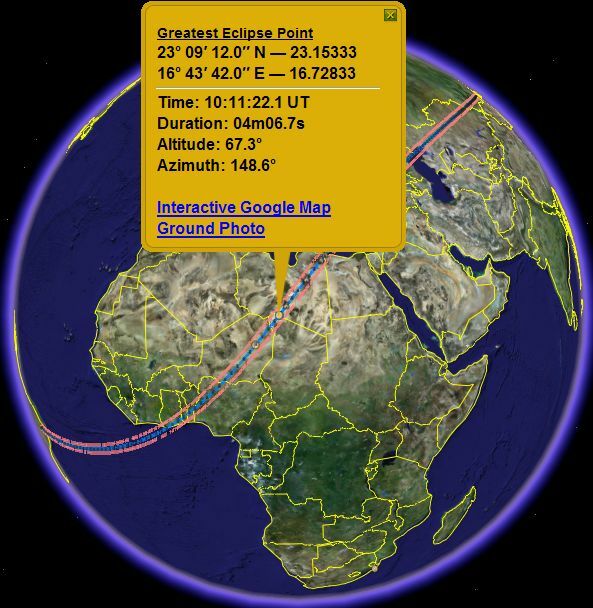 The next total solar eclipse is only 76 days away on 29-March-2006 and crosses over a lot of land mass from southern Russia, across Kazahkstan, Turkey, and right across north-central Africa. Here is the [EDIT: typo corrected] 29-March-2006 Total Eclipse path for Google Earth. Now you can plan your trip with Google Earth for the best location to view the Eclipse, find an airport, make hotel arrangements, figure out which geocaches are nearby, etc. Thanks to Xavier Jubier for creating the GE files and informing me about them. Also, his data came from Fred Espenak, at NASA/GSFC. By the way, last October someone at the Google Earth Community, calling himself 'yaohua2000', posted a huge repository of all the solar eclipses (4.7 Mbytes) since the year 1001 for GE. WARNING: this might take a while to load (4.7 Mbytes), and your Earth will look like a yarn ball after it loads (he defaults with all the eclipse paths turned on). I recommend after it loads you find the placemark folder in your Temporary Places folder called "Eclipses" and turn it off. Then open the folder and turn on the type and year of eclipses you want to see (it is well organized hierachically). This is a very interesting collection of data. I was able to find a total eclipse I saw as a child (a long time ago). Jennifer, this can be done but looking at the moon's umbra moving on the Earth isn't really interesting.